The Automated Technology Group has made significant investments in simulation and virtual commissioning technology in order to prove our bespoke solutions at the design stage. Our simulation expertise is something that distinguishes us from our competitors, enabling us to minimise risk, cost and timescales for customers and giving them ultimate peace of mind before installation. We find that including simulation as a key part of our project process reduces installation time by up to 75% – meaning you can get back to business straightaway. Our simulation engineers use advanced software to explore and analyse a whole host of ‘what if?’ scenarios, allowing the performance of each solution to be optimised. Once the software for your programme has been written, we create a virtual model to show you exactly how our solution will work, using programs such as Robcad, Siemens NX and WinMod. 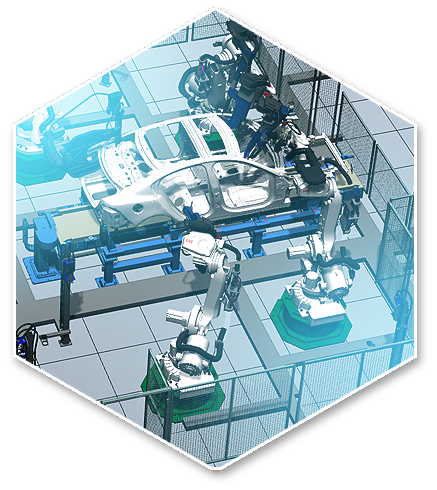 Using the latest generation of our Virtual Commissioning Suite, we are able to test the solution off site in a virtual environment that accurately reflects the real factory, with seamlessly integrated hardware, PLC and robotic systems. Strict adherence to proven processes and group-wide standards – together with an integral, closed loop issue-reporting and tracking system, accessible via a dedicated Intranet site – minimises human error and ensures continuity. We are also able to recreate production and maintenance scenarios that would otherwise be impossible or dangerous. As well as reducing costs, rigorous simulation and virtual commissioning also minimise the risk of machinery damage – and the related safety issues – thereby keeping your project on schedule.